Hot springs are one of the best ways to find relaxation and solitude while on vacation. But, what are the best hot springs to visit? Click here to find out. Have you started your Bucket List yet? If so, what kind of adventures and amazing destinations is it filled with? The Earth is packed with natural wonders just waiting for you to discover and explore. Among these wonders are natural hot springs. People have been enjoying the relaxation and healing benefits for thousands of years. Hot springs are formed by the discharging of geothermal hot water at a specific geologic location. On average, these healing mineral-rich waters stay around 104 degrees Fahrenheit throughout the year. Hot springs are one of the best ways to find relaxation and solitude while on vacation. But, what are the best hot springs to visit? Read on to find out. Few places on Earth are as beautiful as Banff, Alberta, Canada. Seasons dictate popular activities in Banff, from skiing in winter, to biking, fishing, and rock climbing in summer. But Banff’s Upper Hot Springs can be enjoyed year-round. Located 5,200 feet above sea level, these hot springs were originally considered a sacred healing site. The water is mineral-rich in calcium, magnesium, sulfate, sodium, and bicarbonate, making this the ultimate destination for soothing tired muscles and healing damaged skin. 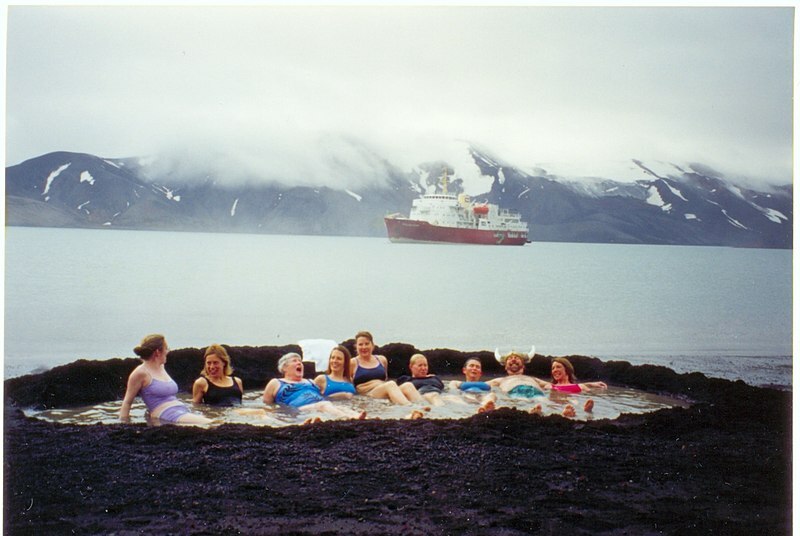 Deception Island Hot Springs is located where an active submarine volcano formed a caldera in the middle of the South Shetland Islands. The temperature of the waters of these springs vary from ice cold to 158 degrees Fahrenheit. Because the island’s heat is hidden beneath the surface, visitors will often dig into the black sand beaches to feel the geothermal heart after taking a plunge into the freezing water of the sea. Travertine Hot Springs is tucked into the foothills of the Sierra in Bridgeport, California, a two-hour drive from Yosemite Valley. Travertine offers only a few shallow pools, heated to 104 degrees at their hottest point, but are lined with mineral-rich clay and filled by ground-fed spring water that trickles down a rocky vein of colorful stone and algae. These springs are swimmable and easily accessed from Highway 395, so be prepared to enjoy conversation with a Spa Mate. These geothermal springs are located in North-Central Italy. According to legend passed down by the Romans and Etruscans, the Terme di Saturnia were created by lightning bolts thrown by the Roman God Jupiter, during a violent quarrel with Saturn. The lightning bolts missed Saturn, causing the formations. These hot springs were once popular among Roman nobles long ago. Set in the Tuscan countryside, it features two waterfalls and pools of 98 degree water rich in sulfur, carbon, sulfate, and bicarbonate-alkaline. The main thermal waterfalls are the Mills Falls, located at an old mill, as well as the Waterfalls of Gorello. The mineral-rich spring water of Terme di Saturnia offers plenty of relaxation, reduces various skin problems, and acts as a deep antiseptic cleaning agent. Next on our list of the best hot springs, is Dunton Hot Springs in Dolores, Colorado, located in the San Juan Mountains near Telluride. They offer waters rich in calcium-bicarbonate, iron, manganese, and lithium, at temperatures ranging from 85 to 106 degrees Fahrenheit. The six pools of Dunton Hot Springs are part of a restored ghost town built in the 1800’s. To get there, you must fly into Durango and then drive. The hot springs has been totally revamped in recent years and now boasts the #7 Luxury Hotel in the U.S. The Grand Prismatic Spring located in Yellowstone National Park in Wyoming is one of Yellowstone’s best hot spring and the world’s third largest. It’s bigger than a football field, at 370 feet in diameter. The thermal water ranges between 63.3 and 86.5 Celsius. This hot spring has bright bands of color. These multicolored layers get their hues fr8om different species of heat-loving bacteria that live in the cooler water around the spring. The center of the pool is deep blue because water scatters the blue wavelengths of light more than others, reflecting blues back to our eyes. This is another of the world’s best hot springs. This thermal spa in Grindavik is the most popular in Iceland. It is actually a man-made lagoon, built in 1976 for filling water from the geothermal power plant that supplies hot water and electricity to 45,000 Icelanders. Visit this Icelandic hot spring feels like you’ve traveled far from Earth and arrived on a distant planet. The mix of seawater and fresh water is packed with a natural exfoliate called silica, and microorganisms around in the water stimulate collagen production. The Blue Lagoon features a swim-up bar and restaurant, and the 98 to 104 degrees Fahrenheit water is so good for your skin that the lagoon boasts its own line of popular skincare products. Pamukkale is a group of hot springs located in Denizli province of Turkey, located below the ruins of Hieropolis. Pamukkale translates to “cotton castle” in Turkish. Known as the Sacred Pool, this divine dip lives up to its name. The eye candy here is a panorama of gleaming white terraced layers of calcium carbonate. Formed over many centuries from at least a dozen mineral-rich hot springs spilling across the steep slope, the pools feature silvery stalactites that look like something out of a dream. This natural wonder is our number one pick for the best hot springs to add to their bucket list of places to visit. Once you’ve begun researching the natural hot springs of the world, the hardest decision will likely be where to go first. One strategy is to start with the hot spring destination nearest to your home and work your way out. Or take the opposite approach by going big right out of the gate. Ultimately, there is no wrong answer. We have all been blessed with an amazing planet rich with natural wonders. The natural hot springs of the world offer a healthy and rejuvenating experience. Start enjoying them now, and over the course of a lifetime you just might be fortunate to visit the all. Lucky you! Contact us and feel free to leave a question or comment. Tagged destinations, holiday, hot springs, travel, vacation.